Iron Maiden's come back!! The classic line-up is here but with an extra guitar player, Janick Gers. The music sounds confident and shows that the band still knows how to play together as a band. 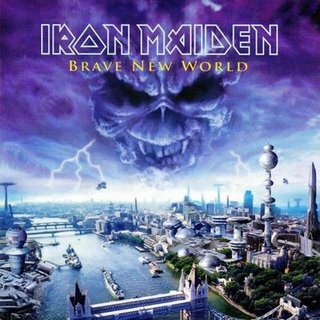 It is of no wonder why Iron Maiden celebrated while hearing the music of "Brave New World": Iron Maiden may be old, but their inspiration is not gone and they returned to where they left off in Seventh Son of a Seventh Son. Yes, that means an album with touches of prog. The album begins with Wicker Man , a straightforward opener with a catchy guitar riff in the choruses. Nothing special. I think the album begins properly with Ghost of the Navigator with good melodies, tempo changes, excellent vocals (I missed Dickinson! ), and inspired guitar playing. Brave New World begins and ends with a melodic soft section, an Iron Maiden trademark. The song is solid and contains great vocal performances from Bruce, showing that his voice hasn't deteriorated with the passage of time. Blood Brothers begins with an irresistible melody and then leads into a great song which is undoubtedly my favorite tune here. The choruses are very memorable. After a guitar solo, a more symphonic section makes up the second half of the song. This section shows that Iron Maiden is progressing from where they left off in Seventh Son of a Seventh Son. The Mercenary is straightforward and very repetitive, making this a low point of the album. Dream of Mirrors is a very sophisticated song clocking at over 9 minutes. It has a very inspired soft arrangement throughout most of the first half and the song seems to have two types of choruses: a soft one and a heavier one "I only dream in black and white". The second half is faster-paced and both halves show some of the best vocals from Dickinson. The Fallen Angel is another sort of straightforward hard rock tune with its solos after the second chorus, the last one being the best of them. The Nomad is an attempt at creating an epic. It is closer in style to "Alexander the Great". Its verses/choruses play with arabic scales and are the least enjoyable moments of the song due to the lack of inspiration in the arabic guitar riffs and the choruses. However, there is a magnificent bunch of solos around minute 3 and the instrumental section on crescendo is one of Iron Maiden's most inspired moments musically in my opinion. Very symphonic and melodic, it recalls Seventh Son of a Seventh Son at its best. Out of the Silent Planet is a catchy fast-paced rocker that exceeds the duration it needs in my opinion, being quite repetitive. The Thin Line Between Love and Hate is another epic that in my opinion is not as captivating as the previous two longer songs of this album. It has some inspired moments throughout but for me is one of the least memorable songs of the album. The second half is pretty good though and manages to end the album in a strong note. Anyways, to sum up, this is a solid 3.5 star album with the classic line-up. The songs range from mainstream fast-paced repetitive rockers to elaborated prog-metal epics and some songs in between (accessible melodic mid-lengthed tunes like the title track). This may not be Iron Maiden's strongest album, but man, isn't it good to hear that they are back in the act and releasing quality music? The following albums are better, and I am very excited to hear what may be next.